Puede seleccionar como máximo 12 viajeros en total. 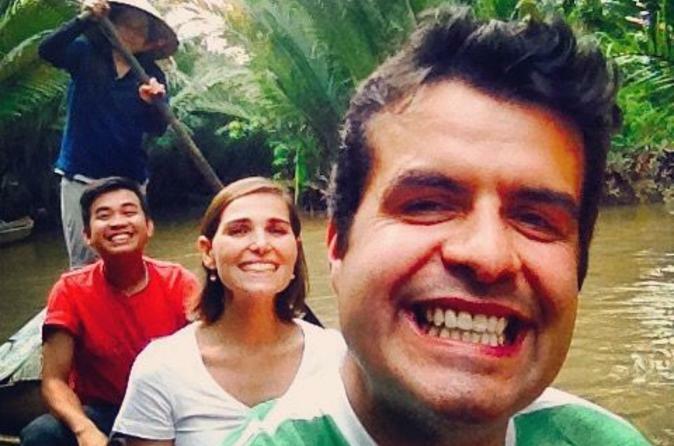 Viaje desde la ciudad de Ho Chi Minh al corazón del delta del Mekong en un tour en grupo pequeño dirigido por un guía local experimentado, navegando por el poderoso Mekong en un bote privado de cola larga. Experimente este importante delta del río de primera mano mientras explora tanto los canales con sombra en la jungla como los amplios cursos de agua para ver pueblos de pescadores, granjas de frutas exóticas y los ritmos de la vida diaria. También disfrutará de un almuerzo de platos tradicionales del delta del Mekong y degustará especialidades locales en el camino. Prueba los platos especiales del Mekong durante el almuerzo. Viaja en un sampán a lo largo de los canales a la sombra de los cocoteros. Prueba frutas exóticas y visita una granja de dulces de coco. Viaja en un grupo pequeño con un máximo de 16 pasajeros para una experiencia más íntima. First off, the company was kind enough to allow us to reschedule our trip last minute due to me getting food poisoning the night before. Once we finally went, the trip was amazing. Very interesting and adventurous. The driver of the boat was even kind enough to take care of my husband who got sick from food poisoning the night before the trip. I felt scared leaving him on the boat, but he was in good hands. We had a small group with 7 nice people and a quite nice and smart tour guide. Ni (or called Sunny) made it to a special day. The trip was well organized. I recommend it to all others! Highly recommend this tour for people who want the thrill of countryside life and are not too worried about time passing by - just relaxing and being in the present! I took the tour on 24-Nov with a most attentive and caring guide, Linda. She made sure we were enjoying ourselves and immersing in the life outside of Ho Chi Minh city. She was very knowledgable and even shared some of her personal stories too. The highlight for me was riding the small boat in the delta and fantastic lunch! This was a great little tour. You see a lot and our tour guide was fantastic. Excellent tour! They packed in a lot of stops with food, local musicians, multiple modes of transport on water and land. Very good overview of the Mekong Delta area. Our guide Thanh Truong was entertaining and knowledgeable. This was an enjoyable day , it was a bit more commercial based than I thought with many stops at places that wanted you to buy . The bee farm, the coconut candy, even the first shop where we had musical entertainment had the tip box going around . Having said that though each place was worth visiting . The tea and snacks we received were tasty .The ride in the Tuk Tuks was an adventure, hold on tight . Lunch was delicious. The ride in the Sampan after lunch was the highlight as this felt you were getting The Mekong experience so would have like that to be longer . 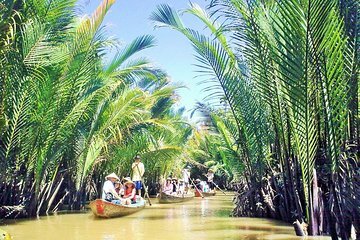 A good tour if you want a taste of The Mekong life . Wonderful tour. Our guide was so friendly. Smiley and informative. We really enjoyed our day out. Not real setting, too stylized for the tourist. Our guide did a fine job.